Jacked Up Floats | Tennessee Aircraft Services, Inc.
A rare bird (at least for us) came in for its first annual inspection since delivery from the Cessna factory. It’s a beautiful 2015 Cessna T206H on amphibious Wipline floats. Standing so tall on the landing gear, it’s quite an imposing site, especially inside the shop. This is only the second amphibious airplane I’ve ever had the opportunity to work on and looked forward to learning something new. 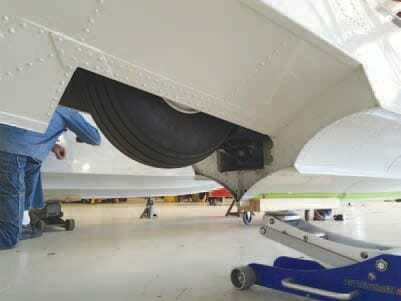 There’s not much different about the basic airframe in terms of annual inspection items. The floats have their own inspection list that’s pretty straight forward. 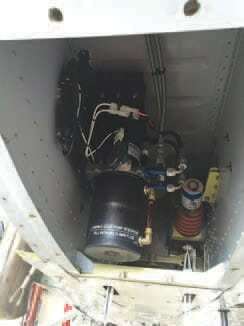 The aircraft has some extra hard points where float struts are attached, but it’s just some extra hardware to inspect and a few added gussets to see. A ventral fin is installed that necessitates two tail tie down rings on the aft bulkhead. 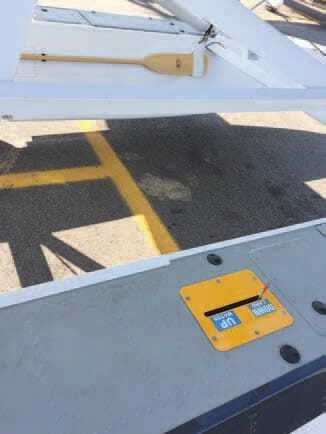 The rudder has a much longer chord than the original. The vertical fin and rudder both are taller than the Cessna standard. The extra chord on the rudder as well as more at the top. Also, the ventral fin is added and installed tail tie downs on each side. All’s pretty normal and straight forward until one notices the undercarriage switch with four blue up lights and four green down lights. Having retractable landing gear on a 206 is one thing, but four wheels instead of three is another. The various gear up vs gear down landing scenarios make for a very different approach (pun intended) to landing checklists and procedures. Landing with the gear retracted in an R182 or 210 seldom serves a positive purpose. 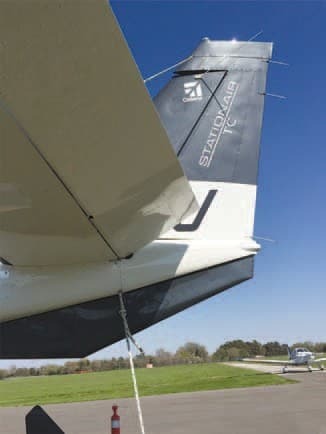 When presenting the CPA Systems and Procedures classes, we spend a good amount of time making sure everyone understands that landing with the gear retracted is not an emergency situation. No one gets hurt, there’s no fire, and we don’t worry about the airplane because that’s why we pay for insurance. The same can be said about landing an amphibious 206, landing with the gear up isn’t a big deal, on water or land. Of course, landing on water with the gear up is the norm and a good thing. Unlike land lubber aircraft, intentionally landing a float plane without landing gear on land (sod) isn’t an uncommon practice. 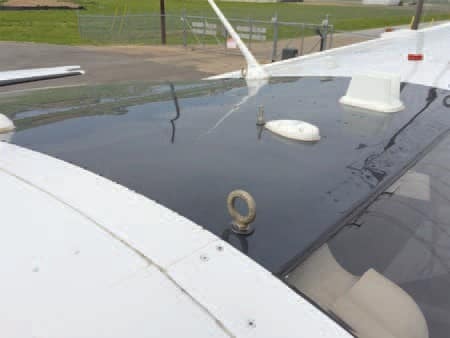 One possible reason being a float plane not equipped with landing gear might land on the grass if taking the plane in for service at a shop on a land locked airport. The keel of the floats is plenty strong to handle the landing as long as the surface won’t scrape the keel down to a nub. Landing on grass with wheels retracted on amphibious floats is also an option if the gear won’t extend and there’s no suitable body of water around. Just side stepping the runway in favor of the grass is usually sufficient to protect the keel. Landing on water with the gear down is a very bad thing. It’s far worse than landing a land plane on land with the gear up. A quick YouTube search for “water landing with gear down” will bring up some very educational videos. As one might imagine, keeping the whole land, water, up, down thing straight in one’s mind requires a great deal of vigilance. Any lack of due diligence means nearly instant disaster. 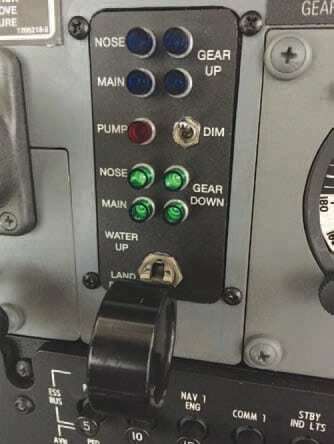 In the same way the pilot must be vigilant with the positioning of the gear, the mechanic must be sure the retraction system is in reliable operating condition. Unlike land lubber airplanes, the amphibious undercarriage must be equally reliable in both up and down operation. This being our first amphibious high wing Cessna annual, we might not have fully vetted the lifting process needed for swinging the gear. We innocently assumed our wing jacks would work in the same way as used on the R182. Once the plane was in the hangar, we realized our jacks might go high enough, but no way were we willing to deal with so much mass teetering from points that far above the floor. 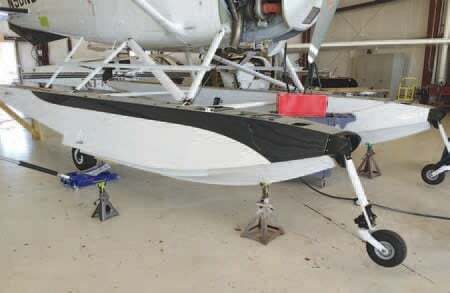 The Wipline service manual gives two jacking procedures for the plane on amphibious floats. The first is to use a standard automotive floor jack placed under the float keel just forward of the main wheel. It is stated to only jack one side of the plane at a time and obviously intended as a way to change the tire. Since all four wheels retract at the same time, this isn’t quite what we’re looking for. The second method is to lift the plane by the four eye bolts on top of the cabin. They are mounted at each of the four wing attachment points and can be used to lift the entire aircraft. Of course it requires some sort of device capable of lifting a few thousand pounds. Unfortunately, I just didn’t have the confidence that our hangar’s roof structure could support that extra weight, so we needed some other lifting method. This isn’t rocket science, but the stakes are high if something should go wrong. Lifting eye hooks on top of the cabin. Could be a handy option for most any airplane. We queried Wipaire support for other options to lift the plane. They sent a single page document with a generic procedure which was a variation of the tire change jacking process. There were very few details in terms of measurements for exact jack placement or design of the jacking blocks needed. It also called for jacking one side at a time, which we determined a very dangerous method on the face of it. We simply used two floor jacks and lifted both floats simultaneously. It was obvious to us that Wipaire is somewhat old school and expected aircraft mechanics to act like mechanics and figure out certain details on their own. The Wipaire procedure lifts the plane using standard automotive floor jacks near the balance point with jack stands forward and saw horses aft for balance. We adjusted the jack position a couple of times and found a spot that allowed one person to lightly press on the aft end of the floats to hold the plane level. Once all was in place we found it far more stable than any other plane sitting on jacks. We learned two important details from the Wipaire document. First, the keel of the floats could withstand the pressure of lifting from a single point with a wooden block in place to act as a buffer. Second, the lifting point isn’t detailed, so the jacks may be located as needed to balance the aircraft. I try to visit the seaplane base at Oshkosh during AirVenture every year just to wet (another intended pun) my appetite for flyable watercraft. The atmosphere is cool and relaxing. Just hanging out watching the seaplanes taking off and landing is a rare sight for most of us. Whether on the water or in the hangar they’re just imagination inspiring to see. For those of you that work on and/or fly float planes on a regular basis, this subject isn’t likely to create much excitement. Many of the rest of us find the idea of a 206 sitting on top of a pair of floats sitting on top of four wheels sitting on top of a set of jacks inside a hangar to be a very cool and unique sight.